Iain Duncan Smith has once again demonstrated how out of touch with reality he is. In an absurdly self-congratulatory speech he compared his “welfare reforms” (which are hopelessly inefficient, economically illiterate, dishonest, unlawful,discriminatory, fraud riddled, punitive, target driven, wasteful, incompetently administered and compassionless) with the abolitionist movement of the 19th Century. I don’t normally go in for psychological analysis, but Iain Duncan Smith makes an absolutely fascinating case because he is such an unbelievable narcissist. In Iain Duncan Smith’s worldview, he is some kind of infallible superhero and anyone that dares point out his appalling mistakes (which are far too innumerable to count) is to be instantly dismissed as “the enemy“. 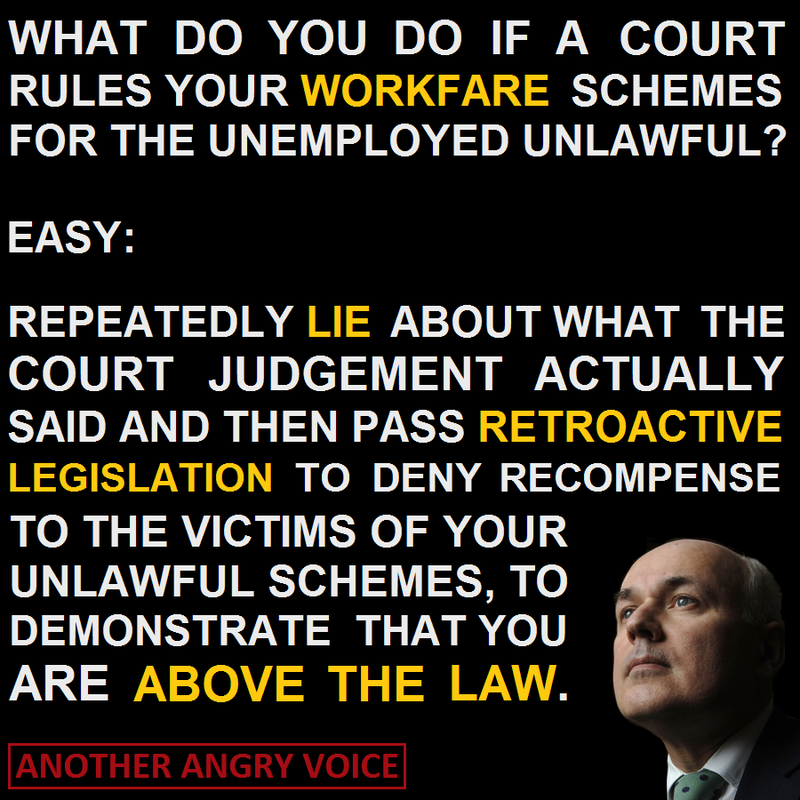 After Iain Duncan Smith’s “Workfare” mandatory unpaid labour schemes were declared unlawful by the courts (due to the unintelligibility of the rules) , IDS repeatedly lied about what the court judgement actually said, then stuck two fingers up at the justice system by pushing a truly outrageous piece of retroactive legislation through parliament so that his “Workfare” rules would have been intelligible had they been written that way in the past! After the courts twice declared that Iain Duncan Smith’s Atos administered WCA regime for the disabled is inherently discriminatory, he simply ignored the rulings and continued as if the UK judicial system is some kind of minor irrelevance. After the Trussell Trust food bank group provided evidence that the exponential rise in food bank dependency is linked to Iain Duncan Smith’s welfare reforms he launched into a spectacular tirade which clearly illustrated his desire to have them silenced via the “Protection of Corporate Lobbying and Silencing of Legitimate Political Debate” Bill that the Tories are pushing through parliament despite massive public opposition. It is absolutely clear that Iain Duncan Smith suffers from a psychotic level of narcissism. It doesn’t matter how many catastrophic mistakes he makes, and it doesn’t matter how much evidence is provided that he is wrong, his mind is filled with very little other than an overpowering sense of self-regard. There seem to be two different motivations. His Tory colleagues (the ones that unceremoniously removed him as leader of the Tory party in 2003 after it became absolutely clear how much of an incompetent charisma vacuum he was) hate the welfare state with a passion, so it makes some kind of perverted sense for them to put an incompetent moral andintellectual pygmy in charge of it, in order to inflict as much damage as possible. The unyielding support for Iain Duncan Smith that has been provided by the Liberal Democratmembers of the coalition is harder to fathom. There is absolutely no long-term political benefit to be derived from their undying support for Iain Duncan Smith (despite his regular displays of incompetence, malice, hubris, cognitive illiteracy etc). The only conclusion seems to be that they are prepared to actively support Iain Duncan Smith’s reign of terror over the most vulnerable people in society because they believe it is a price worth paying for a few six figure ministerial salaries and the short lived sense of self-importance that comes with being part of the government. 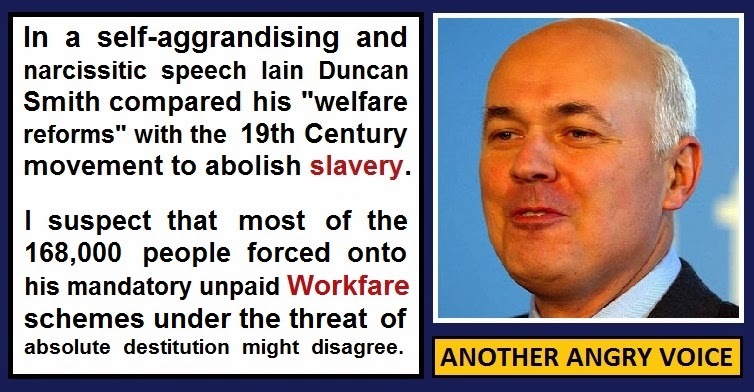 In conclusion, the most offensive thing about Iain Duncan Smith’s narcissistic and self-aggrandising comparison with the famous slavery abolitionists of the 19th Century is not the fact that he is responsible for herding some 168,000 people onto mandatory unpaid labour schemes: It is the fact that the rest of the government don’t just let him get away with being the dangerously psychotic narcissist that he so clearly is, they back him to the hilt and allow him to continue his delusional reign of terror. 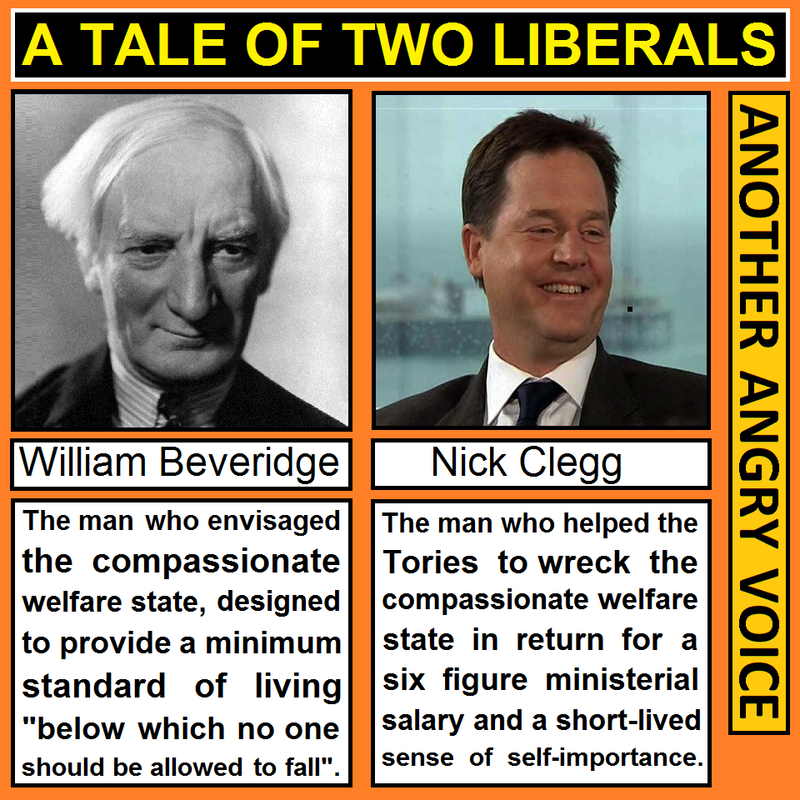 This entry was posted in Uncategorized and tagged food bank, Iain Duncan Smith, Liberal Democrats, Nick Clegg, Trussell trust, UK Statistics Authority, welfare reform, William Beveridge, workfare. Bookmark the permalink.